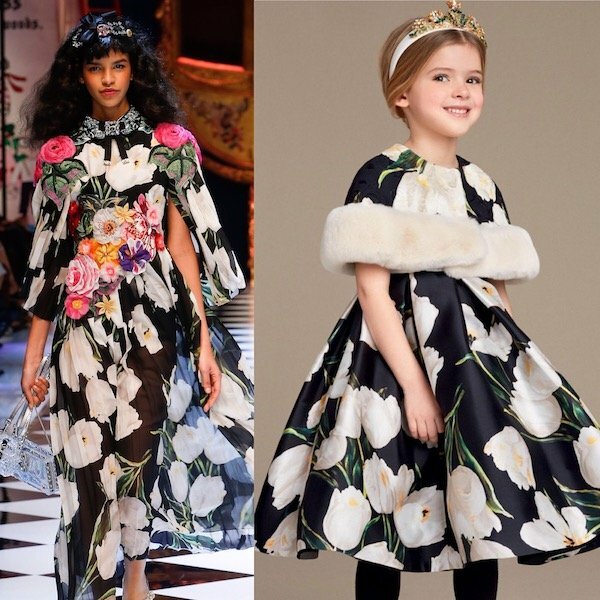 This is a stunning look for girls by Dolce & Gabbana featuring this girls black and white tulip print silk dress and matching Girls White Tulip Cape with Fur Trim. This outfit is made in duchesse silk, and the fabric has a lovely sheen and slight stiffness, maintaining its beautiful shape. This gorgeous dress is perfect for any special occasion with its fitted sleeveless bodice, round neckline and gathered skirt at the waistline, flaring out into box pleats. Looks perfect with this DOLCE & GABBANA Girls White Tulip Cape with real Fur Trim. She'll look like a true princess with this DOLCE & GABBANA Girls Black Satin Hairband with Pink Tulips & Crystals. Inspired by the Dolce & Gabbana Women's Tulip theme featured on the runway at Milan Fashion Week.